Feed with a mulch of high nitrogen fertiliser in spring. Keep plum trees mulched with wood chips or sawdust. Marjoram, Catnip, Coriander, Rosemary, Parsley, Dill, Marigold, Garlic and Lovage. Corridors within the orchard that are planted with clovers and other legumes contribute to soil fertility and attract pollinators. Plums can be affected by silverleaf disease – prune in dry weather in summer to help avoid infection. 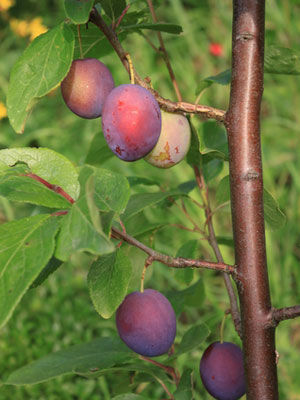 In humid climates, plums often develop problems with fungal diseases such as brown rot. Preventive sprays with organic fungicides are often needed to grow good quality plums.